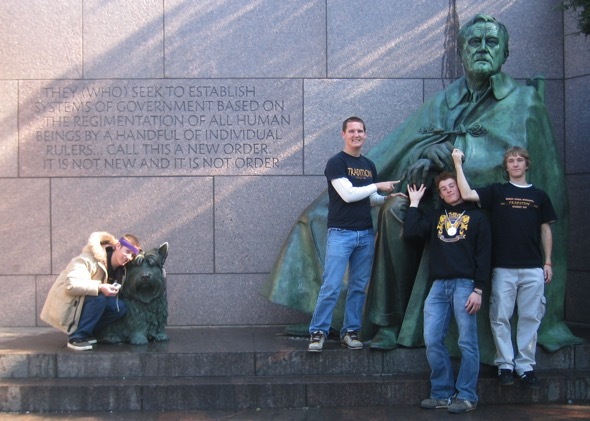 In 2007, my son Ryan (standing in the center) and fellow student council members from Mesa High School visited Washington, DC. Yesterday, I happened across this old photo of their visit to the FDR Memorial. I find it ironic that the man who presided over such a huge expansion of the US federal government would utter these profound words. Now, seventy four years since President Roosevelt made this somewhat prophetic statement, there is ample evidence that a few people in politically elite circles are trying very hard to consolidate power over our lives into the hands of a very few.